Welcome home! The lights are twinkling, more fun we're bringing, and all is arranged in a very merry fashion just in time for our Christmas open house that is beginning tomorrow morning!!! At 10:00 am our frosty gates will open for a day filled with excitement and wide-eyed anticipation of all things Christmas...Sisters' style! 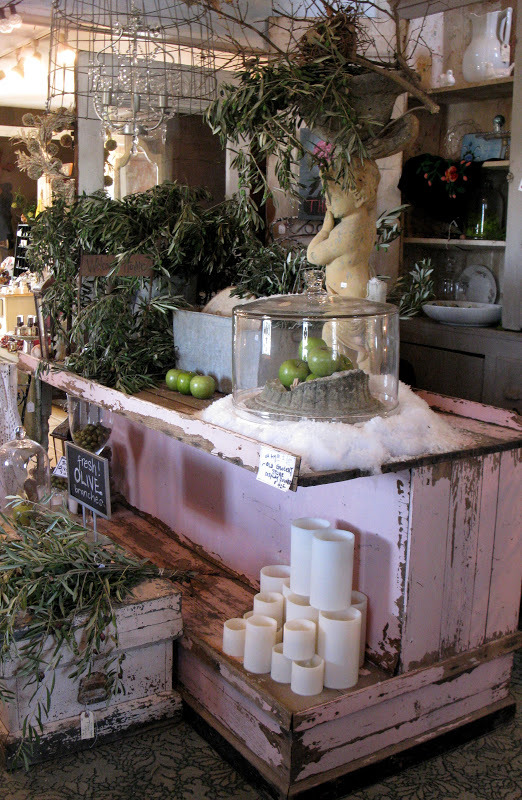 Things like this amazing old pink grocery store counter, fresh olive branches, and this humongous old glass display cloche, are just a few incredible pieces that are gracing the stores for loads of shopping pleasure and the sweetest eye candy! Stay until evening, for more shopping with the sparkling of low light and great company! And then...the party continues Saturday too, from 10:00 am - 5:00 pm! Welcome home to Sisters...holiday happiness is here!